In the 1960s Adel Rootstein began to design and manufacture a series of mannequins that would capture the zeitgeist of the decades she worked through. Her creations were modelled on the ‘It’ girls of each decade, beginning with Twiggy in 1966. Her ability to forecast trends in fashion and beauty ideals secured her success and today the Rootstein company is a world leaders in its field. Rootstein mannequins owe their success to their ability to represent a similar vision to what we see on the pages of fashion magazines and catwalks. In a 1983 interview, Adel Rootstein said, ‘I wanted to make mannequins relate more to the fashion photography and journalism because fashion was coming off the streets, as opposed to coming down from the aristocracy’ (1). The high drama of a fashion photograph is perfectly captured in a Rootstein mannequin, from the exaggerated pose of the body, to the features of the face and dramatic makeup. The company was established by Adel Rootstein and her husband Richard in 1956, exactly sixty years ago. Born in South Africa, Rootstein began her career first as a prop designer, before moving on to window dressing. She wanted to create mannequins in the image of ‘real girls’, which was perhaps a reaction against idealised dummies seen in shops a decade earlier which were no longer suited to wearing fashion that was now ‘coming off the streets’. The 1960s was a revolutionary decade for both clothing and shopping. The mini skirt was designed with youth in mind and the cheap and cheerful fashions of Biba were targeted at teenagers. These kinds of clothes did not suit hourglass shaped mannequins, most of which were leftovers from the 1940s thanks to post-war austerity. Their ‘34-17-34’ measurements reflected a body type achieved with the aid of a corset, a garment which was never worn by iconic 60s models such as Twiggy (2). The shops of the 1960s were also redesigned to reflect youth culture. Pop music blasted from the new boutiques of the King’s Road and Carnaby Street, and browsing was encouraged. This was in stark contrast to the strict customer service etiquette employed in earlier stores. One craze involved the use of ‘gogo girls’ dancing in shop windows to attract customers. Rootstein certainly had picked the right moment to bring mannequins to life. ‘Adel Rootstein’s Beauties look so alive you’d swear they breathe,’ reads the headline from a 1994 article from the LA Times (3), but Rootstein did not produce wax doppelgangers. Company Director Michael Southgate was emphatic about the mannequins’ distance from the Tussaud’s lookalikes. Rootstein worked as a window dresser (more commonly referred to today as visual-merchandiser) and so designed mannequins that would sell clothes. Their beauty is strictly an idealised and the poses are dynamic - as Sarah Schneider puts it, the mannequins look as though they might take off (4)! The Twiggy mannequin is not simply a reconstruction of Twiggy’s appearance, it is an impression of her whole demeanour and power over the fashion world. Her surly, adolescent stance, legs askew, toes pointing inwards is mirrored by her downturned mouth and wide-open bambi eyes. 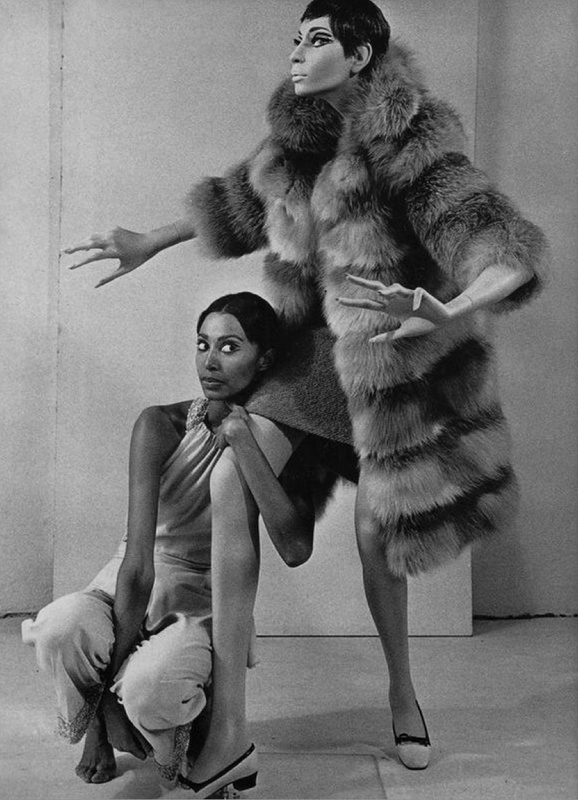 Likewise, Donyale Luna was posed in an exaggerated figure, her limbs at sharp angles and her head reaching out from her body on her elongated neck, like a giant bird ready to leap out of the window at passers-by. Rootstein’s mannequins appeared to have lifelike personalities and this continued through the years with mannequins made in the image of Sandie Shaw, Joan Collins, Yasmin le Bon and Erin O’Connor. Adel Rootstein recognised the need for the display of clothes to keep up with fashion itself. More than just a coat hanger, the mannequin must convey a sense of purpose, inviting customers to associate it with the image they see represented in the shop window. What better way than to provide this association than through the models already recognisable from the pages of fashion magazines? REFERENCES: (1) ‘She managed to put a little life into mannequins’, Michele Ingrassia, in The Tuscaloosa News, 2 October 1983. (4) ‘Body Design, Variable Realisms: The Case of Female Fashion Mannequins’, Sara K. Schneider in Design Issues, Vol. 13, No. 3 (Autumn, 1997), pp. 5-18, MIT, http://www.jstor.org/stable/1511936, pp. 15-16. Olivia Gecseg, Costume Society Ambassador, 2016.